Berkeley Plumbing Contractor | Service You Can Trust! 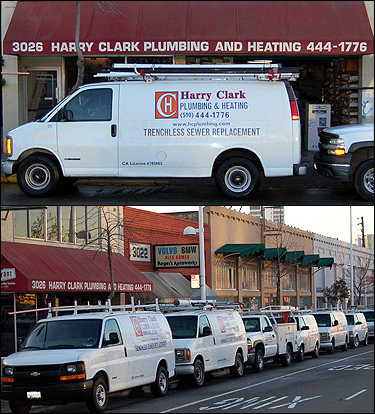 Harry Clark has been a Berkeley Plumbing Contractor for over 60 years. From Berkeley’s Private Sewer Lateral Compliance Policy to the Residential Energy Conservation Ordinance or "RECO" Harry Clark knows how to navigate through city hall. We will obtain the proper Sewer Lateral Certificate or have the job permits signed off. It doesn’t stop there. Harry Clark is a Berkeley Green Plumber. From promotion of water saving Eco-Drake Toilets to Energy Star Furnaces, Tankless Water Heaters, recycling, and continuing education, Harry Clark is leading the way. Berkeley’s weather is nice but when the fog or wind rolls in, it is cold. Whether you need service or repair of your old heating system or need replacement with new, Harry Clark is your Berkeley Heating Contractor. We are highly rated by the Berkeley Parents Network, BBB, and Consumer Checkbook. We Feature Energy Star Furnaces and thermostats, and out technicians are properly trained. Call for service you can trust. We service and know the neighborhoods of Berkeley including Claremont, Elmwood, North Berkeley, Cragmont, Thousand Oaks, West brae, North brae, Oceanview, and West Berkeley.